From tree burials to "Guisin-dong"? There are basically three topics worth writing about: love, life, and death. And when it comes to fiction, since I am (as I write these lines - knock on wood) lucky enough to be both in love and alive, I tend to stick, by superstition, to death. Next year, if I keep being lucky*, I might release a new collection of short stories dedicated to Seoul, an eternal source of inspiration, and already a recurring character in my miserable 'dragedies'. Earlier this year, I wrote "Guisin-dong", a piece about a fictional ghost neighborhood of Seoul**, and I was recently reminded of it when I heard about a potential change in the law which would allow you, under certain conditions, to bury your beloved ones at home. Even in the dead (yet alive) middle of the city. 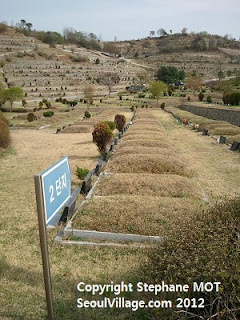 In case you forgot (see "Ghost Month"), I took this picture in Yongmiri Cemetery, a final resting place for Seoulites, up in Paju. And just like in any neighborhood in Korea, each time I pass by Yongmiri, the 'cityscape' has evolved, at the same time growing new tentacles and letting forsaken ones go derelict. Forests are progressively erased to make room for a silent necropolis that requires every year more maintenance - terrace fields of tombs must be tended as well as if they were holding rice paddies, and torrential rains can cause a lot of damage on deforested hills. Korea's rich funeral traditions are as much a curse as a blessing: more than one percent of the land is already devoted to the dead, and demographic trends announce for a near future massive funeral migrations from late Babyboomers. Fortunately, Seoul Metropolitan Government and Korea Forest Service are working hand in hand to avoid that terminal real estate bubble. And they came up with a simple concept: promoting tree burial services. The idea is to bury the ashes of the deceased in a natural setting, generally at the foot of a tree. So instead of cutting plants, you feed them. Literally, the ultimate tree-hugger experience. Since Koreans have now overwhelmingly replaced traditional burial with cremation, it can really make a difference. Last year, SMG and KFS dedicated a special section of forest, also in Paju. With the new law Seoul city wants to make the phenomenon go "grassroot" - if not viral. That's somehow consistent with the promotion of vegetable gardens across the capital. Now what's interesting to me is the consequences at a less rational level. Combine for instance Korea's ancient shamanist traditions with its more recent real-estate-speculation addictions: will there be an impact on land value? will some people use the services of their friendly neighborhood mudang, have a "gut" be performed before moving in or out? Can whole neighborhoods catch the virus? Say Seochon, at the feet of the shamanic magnet of Inwangsan - will it turn into the equivalent of Tokyo's shinto-funeral-crazy Yanaka? PS: if you can't wait, go visit Seoul cemeteries. For instance Seoul National Cemetery in Dongjak-gu (NB: that's not where they bury SNU alumnis, well... not officially), Yanghwajin Foreigners' Cemetery in Mapo-gu, Manguri Park in Jungnang-gu, or the many Royal Joseon Tombs (see "Royal Joseon Tombs Become UNESCO World Heritage Properties"). And don't forget to say hello to "Jongmyo ghosts". * and if I start kicking my own behind to devote more time to fiction and less time to this excuse for a blog (not to mention the half dozen even more inept ones I've been publishing for eons) - I'm running out of alibis at the end of this mother of all election years (US, Korea, France, Russia, Younameitstan).